Not since McCullough's First Man in Rome have I read a story based completely on real events and enjoyed it so much. Like McCullough, Saylor focuses on the Late Republican phase of Roman History, which is probably the best documented periods; or at least the best document pre-empire period. There are pitfalls involved in setting a novel in this period however - the more well known the time, the less room you have to "fudge" it. Even more so when you are covering a documented event (Cicero's first murder trial). 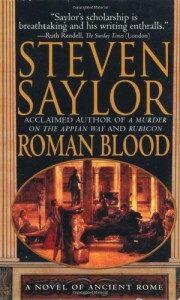 If there is one thing that Saylor excels at in this book though, it is weaving historical fact into fiction. Some of the greatest colour stories of the time sneak in to the background of this novel, from Sulla and Metrobius' long-lasting and affectionate friendship, to Crassus seen in the act of bullying a cheap price out of a tenement owner whose building looked about to catch fire. This is a complex, well written and wholly satisfying book and I greatly look forward to the others in the series.